The list is endless. But mindfully engage in an activity related to my dance. And document it. I chose to use Instagram. It’s accessible in the sidebar, if you’d like to peruse my results. And the goal is not perfection. 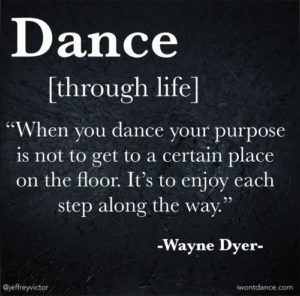 The goal is the process of learning and improving my dance, of inspiring myself to create, of dancing. I invite you to join me. Choose your own method of documentation. But do document. It encourages accountability. Personally, I need the accountability. Feel free to share your preferred documentation here. I’d love to see what you’re doing!